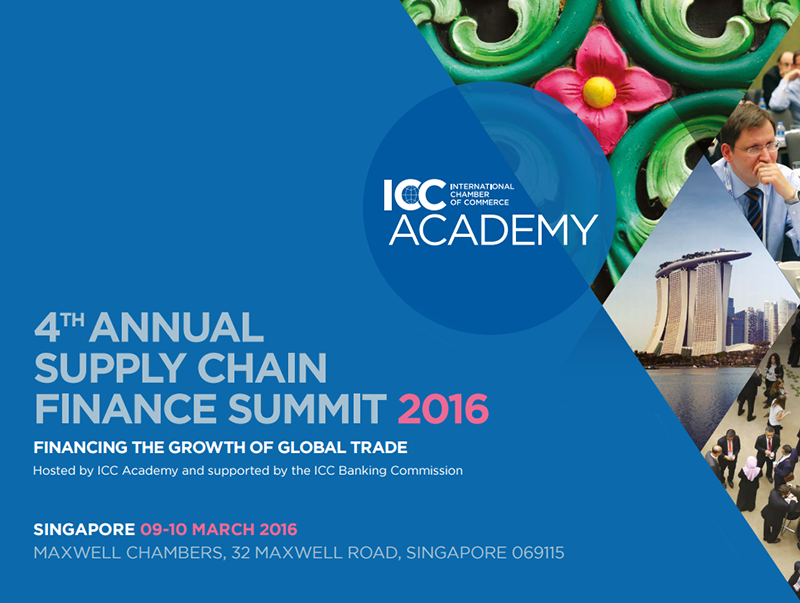 There’s not long left to register for the ICC Academy’s ground-breaking Supply Chain Finance Summit in Singapore on 9-10 March. The annual Summit, now in its fourth year, has become the go-to event for supply chain finance professionals from across the world. Here are three reasons why our 2016 Summit is not to be missed. The Summit will feature the global launch of new industry terminology for supply-chain financing-which has been developed through an extensive process involving a broad range of industry groups and financial institutions. The Summit will provide an inside view of the new industry standard terminology-a product which is widely expected to support rapid growth in supply chain financing-with presentations from members of the ICC-led group which produced the new terms. Speakers will include senior representatives from Euro Banking Association, Commerzbank, ANZ, Standard Bank, and Deutsche Bank. The Summit will provide delegates the first opportunity to discuss the benefits of the new terminology, the proposed structures and techniques, as well as the next steps in its global adoption. The Summit also features panels, and case studies presented by leading players and industry experts, with this year’s line-up reflecting the progress of the industry – providing unique insights into the trends, opportunities, and challenges affecting supply chain finance. These sessions will cover topics including supply chain financing in Asia, the importance of small- and medium-sized enterprises (SMEs) and strategic suppliers, the transforming role of financial technology (fintech) in finance and the market response to increasing regional usage of the renminbi, among others. 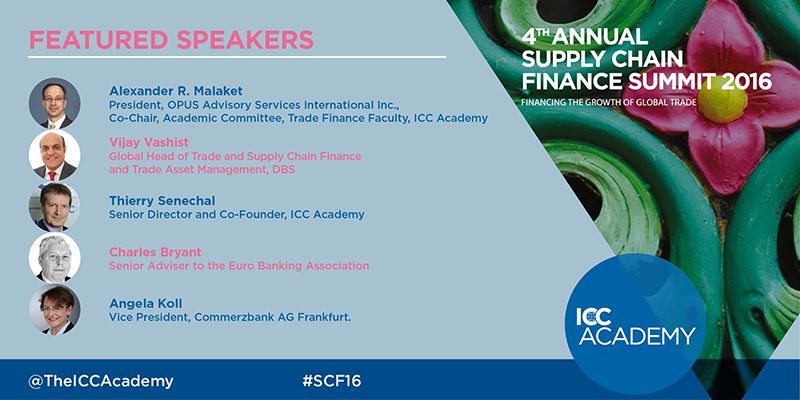 If you want to know where the supply chain finance market is headed, the Summit is an event not to be missed. The Summit will welcome 150 trade finance experts, CFOs, corporate credit and risk managers, corporate treasurers, import managers, trade specialists, bankers, insurers, consultants and vendors from all over the world. Participants will have invaluable opportunities to network with other like-minded professionals and-what’s more-ICC Academy members can earn up to 15 professional development credits (PDCs) towards any ICC Academy certification. “The Supply Chain Finance Summit is an annual International Chamber of Commerce (ICC) event created in partnership with the ICC Banking Commission. This year is the first time the Summit will be held in Singapore – a leading international trading hub where supply chain finance is widely used,” said Thierry Senechal, Senior Director and Co-Founder of the ICC Academy.